Bricks are everywhere in the Baltic Sea region. They are historical witnesses of the middle ages in northern European coastal countries. This authenticity and the common architectural language associated with medieval brick buildings are the focus of the association European Route of Brick Gothic (EuRoB). EuRoB began as a project funded by Interreg back in 2002. Today it is a cultural route of 1500 km along the Baltic Sea coast. The technique of baking red bricks was brought to the Baltic Sea region from Italy in the 12th century. This novelty was a bliss to northern European countries where commonly used building material such as stone and timber were running low. This technique was distributed among some 200 towns of the Hanseatic League. Gradually, baked bricks became the prevailing building material and townscapes along the Baltic Sea flourished in different shades of red. As these buildings visually share characteristics widespread in other styles of Gothic architecture, the new style was called Brick Gothic. The idea for the European Route of Brick Gothic originates from Professor Gottfried Kiesow, known for his substantial contributions to monument conservation in Germany. In 1998 he initiated a touristic route along the German coast of the Baltic Sea connecting Rostock, Lübeck and other towns rich in Brick Gothic buildings. The route was not a physical path but rather a thematic structure linking tourist centres, museums and local governments. These institutions work together in trying to preserve local heritage and making it more attractive to tourists. Following this regional route, Kiesow contacted the German association for housing, urban and spatial development in the late 1990s with a proposal to expand the route beyond German borders. Geographer and urban planner Christoph Pienkoß, who had just started his career at the association, was enthusiastic about the idea and took on the proposal. In 2002, 26 partners from six countries teamed up to connect different touristic destinations with Brick Gothic heritage beyond borders with financial support from Interreg Baltic Sea Region. The project partners came up with a model to jointly manage and develop the route and created a marketing strategy. The route attracted international attention to Brick Gothic heritage in different towns and cities of the region, for example, in Chełmno, northeast Poland. “,Brick Gothic monuments in Chełmno are our most valuable asset,” says Elżbieta Pawelec, representative of public relations and tourism in the municipality of Chełmno. “When I first heard about the project EuRoB, I knew right away that Chełmno must join.” The inland city of Chełmno was oftentimes neglected by tourists, who preferred travelling along the coast. After Chełmno got involved in the network, it received financial support for renovating monuments and improving infrastructure for tourism such as multimedia info kiosks. At the same time, Chełmno became more known outside Poland as project partners helped to spread multilingual leaflets and catalogues about it. “Thanks to the distribution by all EuRoB partners, we have gained international advertising for Brick Gothic sights of Chełmno. We would have never done this alone,” says Pawelec, who is currently the second deputy Chairwoman of the Association EuRoB. As international interest grew, so did the appreciation of the heritage within small town communities. One of the examples is Parchim, a small inland town in northern Germany. It received financial support to refurbish the roofs of two Brick Gothic churches and make them accessible for people to enjoy panoramic views. As soon as the refurbishment started, locals actively became engaged in construction work. 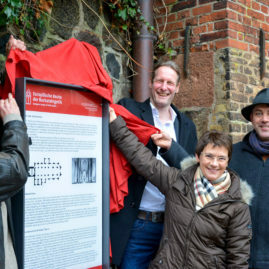 “It seems that promotion within the network and rising attention from outside encouraged locals to identify themselves with the heritage, appreciating it more than before,” said Pienkoß. During the period of the first Interreg project, partners grasped that there is more potential in joining forces to promote common cultural assets. Therefore, they launched a second EuRoB project together that aimed to create an institution that continues its work without project funds. In September 2007 the network was established as a non-profit association “European Route of Brick Gothic’’. At first, only eight members decided to join the association by paying an annual membership fee of 2,500€. “The shift from a funded project to an institution that would mainly run from its own money was not so easy,” recalls Pienkoß. However, after one and a half years, 25 former partners had re-joined the network. The route never stopped expanding and today the association manages a 1500 km long route connecting 39 inland and coastal towns in Denmark, Poland and Germany. In 2017 all the members gathered in Greifswald to celebrate the tenth anniversary of the association. During ten years of cooperation, EuRoB proved to create immense benefits for the regions – not only to preserve and promote the heritage but also to boost economic development. “Working within the network contributed one to two percent to tourism of these cities,” says Pienkoß. “This growth adds up in the economies of towns and cities, as visitors stay overnight and spend their time there.” The economic return for each town and city must surely pay off as they choose to stay in the network and invest the yearly membership fee to maintain and develop the association. Within ten years of working together, a lot has been done to ensure long-term cultural and economic benefits. By pooling professionals and attracting resources to the renovation and joint touristic marketing of Brick Gothic buildings, Interreg has delivered visible and attractive results for cities and regions along the Baltic Sea coast.